The Mott’s company sells packets of instant Hot Spiced Cider in a couple different flavors. Someone gave me some packets and so I tossed them into my basic applesauce bread recipe and it worked wonderfully. See for yourself. 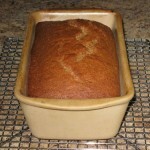 Preheat your oven to 350 degrees and lightly grease a loaf pan. Place the eggs and milk on the counter while your oven preheats; give it at least 20 minutes. Using 1 bowl for wet ingredients and 1 bowl for dry: add all the ingredients. Whisk both separately then add the dry to the wet. With a wooden spoon mix just until combined – count to 20 slowly. Then with a spatula, give it a couple of mixes to make sure the dry ingredients are mixed up from the bottom of bowl. 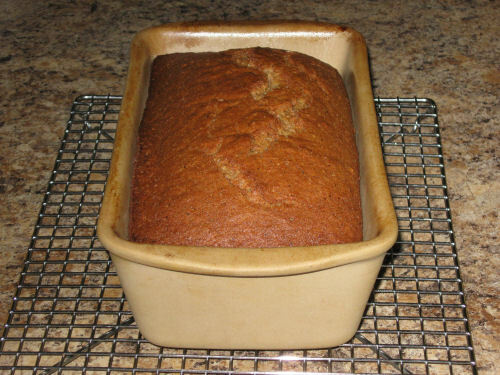 Scrape into the loaf pan and place in the oven for 50 – 60 minutes, until a toothpick comes out clean. Cool on rack. Sprinkle with confectioners’ sugar if the mood strikes you. Dig in.